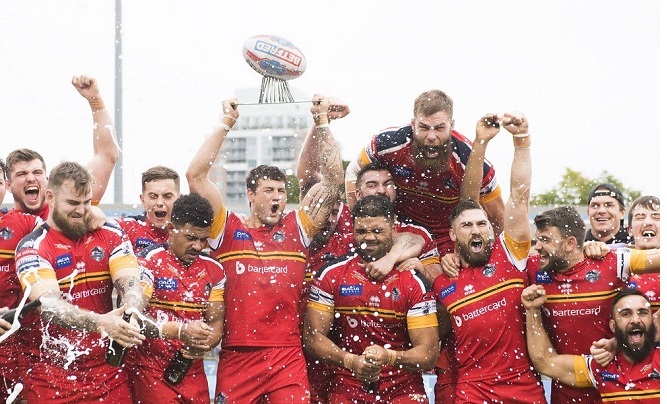 London Bronco’s defined the odds and produced a out standing performance to overcome heavy favourites Toronto Wolfpack to claim a place in next years Bet Fred Super League with a 2-4 win in this year’s ‘Million Pound Game’. With just three penalty goals in the entire match, which was a mixture of subborn well drilled defence mixed in with some sloppy school boy errors in attack from both teams as the nerves sometimes got the better of some of the players on show. The big spending Wolfpack, who were looking at back to back promotions after walking league one at the first attempt and then topping the table in this years Championship, could consider themselves unlucky at being in this situation after only missing out on automatic promotion due to points difference after finishing level on points with Hull KR in what has been the tightest middle eight qualifiers to date. In a game in which Toronto were held up over the line no less than three times, the only points of the first half came from the boot of Maltese International Jarrod Sammut. The Wolfpack’s Gareth O’brien levelled with a penalty of his own early in the second half, before Sammut again popped a penalty over to restore his sides advantage. O’Brien who has been his team’s saviour in this situation before when he produced a winning drop kick in Golden Point time two years ago when he was at Salford, a point which saved Salford’s place in super league and saw Hull KR relegated to the Championship. “They have been a credit to London rugby league since day one when we looked around on the first day of pre-season at a room full of kids,” he said. In only his first full season in charge, the former Leeds Rhino’s and London Broncos Prop was promoted from assistant coach when Andrew Henderson joined the staff at Warrington Wolves 12 months ago capping off an excellent 12 months for both the Club, staff and players. The Bronco’s will now take the place of Widnes Vikings who finished second from bottom in the middle eight’s. Salford Maintain 100% record, while Widnes look certain to be playing Championship rugby in 2019.